Brisket. Photo by Teresa Wood. 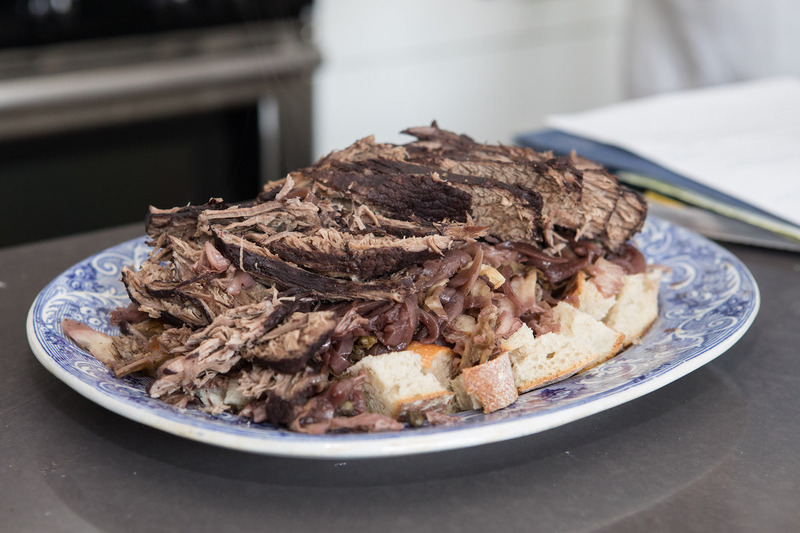 As our First Chefs recipe series continues, Marissa Nicosia writes about a 17th-century recipe for braised brisket. Nicosia is the author of the blog Cooking in the Archives: Updating Early Modern Recipes (1600-1800) in a Modern Kitchen, where you can find even more information about these adaptations. The British are known for their beef. Although poultry, lamb, pork, game, fish, and shellfish abound in British cookery books from the early modern period, beef stands out. Beef is also a perennial refrain in Shakespeare’s works: The Duke of Orleans mocks King Henry’s army’s distress in the middle of Henry V by saying they are “out of beef”; Shylock ponders the difference between a pound of human flesh and that of “muttons, beefs, or goats”; Prince Hal addresses Falstaff with the moniker “sweet beef”; and in Twelfth Night louche English suitor Sir Andrew Aguecheek proclaims, “I am a great eater of beef.” Both as sustenance and cultural signifier, cooking and eating beef was associated with British identity in the Renaissance. Robert May. The Accomplisht Cook. 1685. Folger Shakespeare Library. 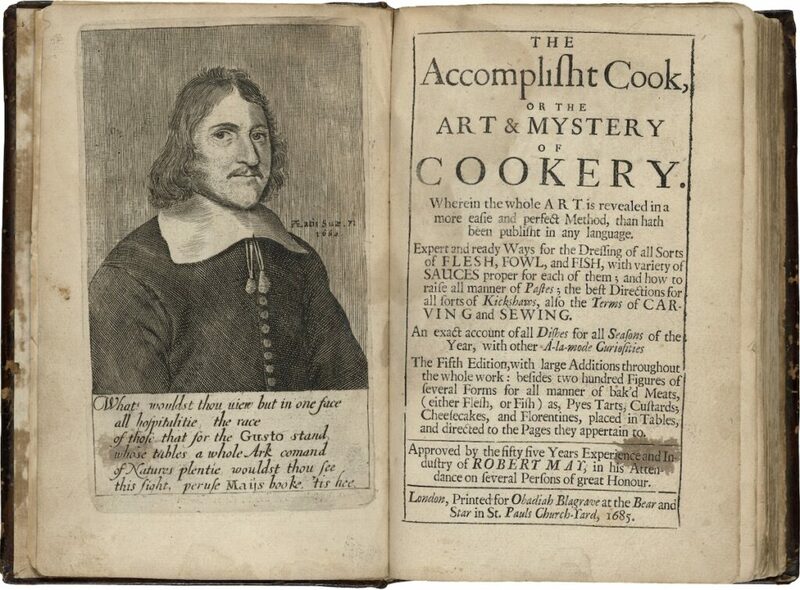 Robert May’s The Accomplisht Cook was first published in 1660 and went through multiple reprint editions in subsequent years. On the title page he promises recipes “for the Dressing of all Sorts of FLESH” and in the pages of this cookbook he certainly delivers. Under the engraved portrait of the chef, a few verses promise that May will provide “in one face / all hospitalitie” of the nation and his recipes will inspire “tables” groaning with “Natures plentie.” For British chefs this certainly meant how to prepare tempting beef dishes. My brisket recipe updates May’s recipe “To stew a Rump, or the fat end of a Brisket of Beef in the French Fashion” for use in a 21st-century kitchen. The following text is from the 1685 edition, but the recipe is also in the first edition from 1660. Take a rump of beef, boil it & scum it clean, in a stewing pan or broad mouthed pipkin, cover it close, & let it stew an hour; then put to it some whole pepper, cloves, mace, and salt, scorch the meat with your knife to let out the gravy, then put in some claret-wine, and half a dozen of slic’t onions; having boiled, an hour after put in some capers, or a handful of broom-buds, and half a dozen of cabbidge-lettice being first parboil’d in fair water, and quartered, two or three spoonfuls of wine vinegar, as much verjuyce, and let it stew till it be tender; then serve it on sippets of French bread, and dish it on those sippets; blow the fat clean off the broth, scum it, and stick it with fryed bread. You may be asking why I’ve turned to a recipe with the descriptor “in the French Fashion” after talking about the British and their beef. Importing wine from France was a long British tradition. May’s recipe specifically calls for “claret-wine” or French Bordeaux especially made for export to the European market. As Paul Lukacs explains in Inventing Wine, in the 14th century British demand for claret was so high that the British imported 80 percent of Bordeaux’s exports. Desire for French claret was “so strong that the Bordeaux wine fleet sailed twice a year—first in the fall, when the ships were filled with as much of the new harvest’s wine as they could carry, and then again in the spring when they transported what was left.” Anglo-French relations had quite a few high and low points between the 14th century and the 17th century when May was writing. Nevertheless, French claret was a mainstay of British drinking and eating culture. Marissa Nicosia, Amanda Herbert, and Heather Wolfe. Photo by Teresa Wood. Moreover, stewing or braising beef in wine was an effective way to transform tough cuts like “rump” or “brisket” into tender stews. In Salt, Fat, Acid, Heat, Samin Nosrat explains the science behind these slow braises. Put simply: the acidic compounds of wine and the low-slow heat tenderize the tough muscle by breaking down its collagen proteins. The addition of acidic capers, wine vinegar, verjuice, and cabbage later in May’s recipe amplifies the potency of the cooking medium. As chef Fergus Henderson shows in his Nose to Tail Eating, it is a very British thing to make use of the whole animal and to use the most effective cooking techniques to render each cut into a delicious dish. A British “Accomplisht Cook,” like May, must make do with the ingredients and methods available to him even if they are, in many ways, French. Preheat your oven to 325°F. Pat the brisket dry and then place it in a large pot fitted with a cover. Add onions, salt, black peppercorns, whole cloves, and mace. Pour in wine, cover, and place in the oven for 1 hour. After the brisket has cooked for 1 hour, carefully flip it over. After it has cooked for 1 1⁄2 hours, add cabbage, vinegar, and capers. Check it at the 2 1⁄2 hour mark. It should be tender when poked with a fork. If not, give it more time. If the cabbage is crowded, rearrange as necessary for even cooking. To serve, cut your bread into cubes and arrange them on a platter. Remove the brisket and set it on a cutting board to rest. Remove the cabbage and onions and place them on top of the bread. Reduce remaining cooking liquid for ten minutes until it thickens. Slice the brisket thinly, and place on top of the cabbage, onions, and bread. Pour the reduced sauce over the whole dish. Serve immediately. This satisfying dish will serve four to six people. The cubes of bread that May calls “sippets” are a common ingredient in meat dishes from this period. They efficiently and deliciously soak up the rich, flavorful sauce. Albala, Ken. Food in Early Modern Europe. Westport, CT: Greenwood Press, 2003, especially pages 164–184. Appelbaum, Robert. Aguecheek’s Beef, Belch’s Hiccup, and Other Gastronomic Interjections: Literature, Culture, and Food among the Early Moderns. University of Chicago Press, 2006. Wall, Wendy. Recipes for Thought: Knowledge and Taste in the Early Modern English Kitchen. University of Pennsylvania Press, 2015, especially pages 35-38. Also check out the Shakespeare Unlimited podcast episode about this book. To learn more about early modern cooking, join Marissa Nicosia on February 1 for Cooking in the Archives, a free Folger Friday before a performance of Nell Gwynn. This recipe was developed by Marissa Nicosia for the Folger exhibition, First Chefs: Fame and Foodways from Britain to the Americas (on view Jan 19–Mar 31, 2019), produced in association with Before ‘Farm to Table’: Early Modern Foodways and Cultures, a Mellon initiative in collaborative research at the Folger Institute. Special thanks to Amanda Herbert and Heather Wolfe for their help. Marissa Nicosia is an Assistant Professor of English at Penn State Abington and co-founder and lead writer of the website "Cooking in the Archives: Updating Early Modern Recipes (1600-1800) in a Modern Kitchen," a public humanities project. The lovely pot you are using to cook the beef, is, if I am not mistaken, a French one. I have an identical one, Le Creuset. Cooks food beautifully. I was pleased to see what looks like generous splodges of wine on the book.